‘Throw yourself on the Universe’ and take a hike – Linda Hall-Stone – Rockland – Camden – Knox – The Herald Gazette. Stephanie White is a former resident of Maine who was a 1990 graduate of Medomak Valley High School. She earned the highly coveted “Triple Crown” of thru-hiking this year, after completing her last thru-hike , this time of the Continental Divide Trail. 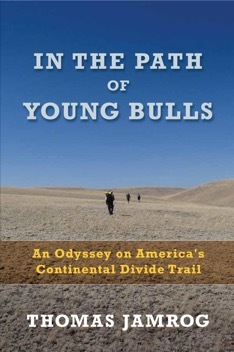 White has previously hiked the Appalachian Trail (twice), and Pacific Crest Trail (twice). The combined miles for the three trails is roughly 7,944 miles. On Aug. 28, 2011, Stephanie had her longest day ever on a hike- 65 miles , and Stephanie has more than 12,000 cumulative hiking miles. After breakfast on Sunday, I went to a workshop by Andy Williams on How to Build A Sling Fireplace. I’d never seen anything like this. There is nothing about this thing on the web, or at least my search’s results. 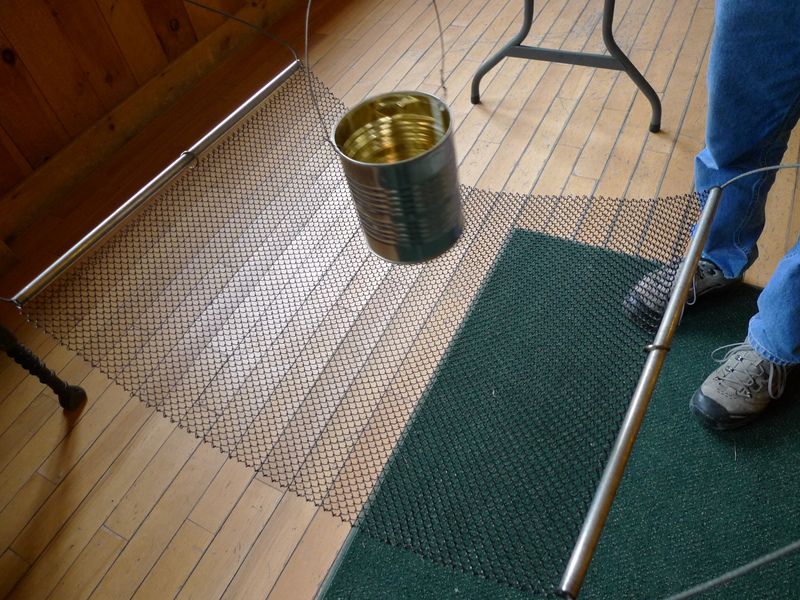 The materials list includes fire place screening, two sections of tent poles, flexible galvanized air craft cable, key rings, a few aluminum cable swages, and P-Cord. The unit rolls up and fits into a recycled Thermarest stuff sack. It is suspended between two trees and the fire is build in the air, resulting in a massive charge of air that quickly feeds the fire through the screening, and has the distinct advantage of leaving the surface of the earth scar free, as well as burning all the fuel into powder. The downside is that the materials cost about $40 due to the 18 feet of 1/8″ cable that runs about $1.29 / foot. 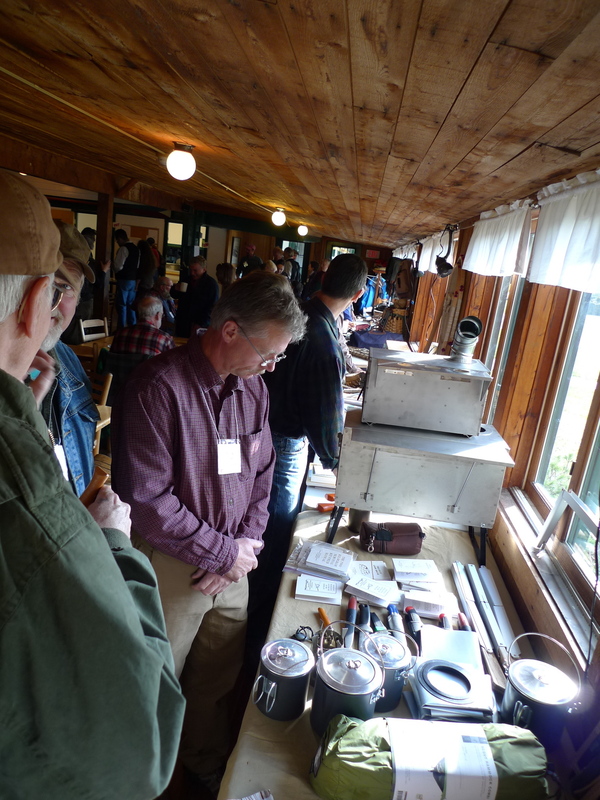 After this was demonstrated and discussed, I wandered out to the back porch where Don Kivelus was re-running his “Trail Stoves: Their Selection and Use workshop. Don told us that dry wood yields 7,500 btu \ lb., with that figure remaining the same no matter what type of wood is used. If you have dry pine available, you arr going to need a lot more of it than you would if you were harvesting dry oak. In this part of the US, the best you can expect from wood that is seasoned out doors is 15% moisture content. On the positive side, pine dries quicker that hardwood. Don advised us to never harvest dead wood that is lying on the ground, due to the relatively high moisture content that is present in the wood. Look for dead vertical standing spruce. Beware of leaning softwood tress, as each degree of lean generally equals a degree of moisture contained in the wood. Here we learned about stove damper basics, and firebox management and such. Don stressed the importance of choosing the right clothing to take with you into the winter bush, with wool still taking preference to synthetics. The second most important thing that you must have with you in winter camping is good fire building skills. Opinels are French picnic knives that have been around for over 100 years. They are easy to use, and are designed to be safe, employing a stainless steel locking collar that prevents the knife from accidentally opening or closing. 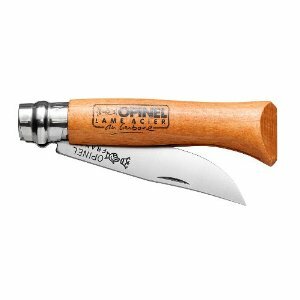 Opinel knives were ranked as one of the “100 most beautiful products in the world”, by the Victoria and Albert Museum in London. They are only $12, and come a three sizes. They feel good in the hand and fit easily in a pants pocket. 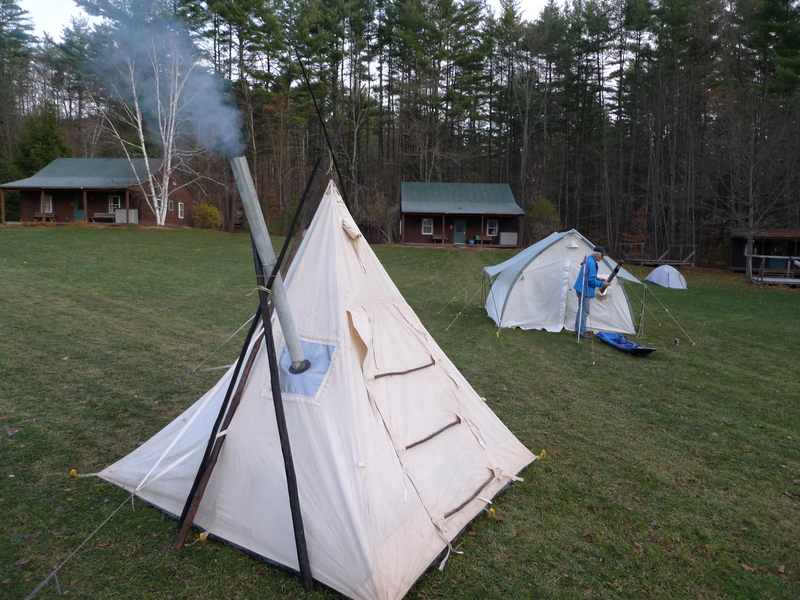 Snow Walkers’ rendezvous is all about improving winter camping skills. One of the past things I heard Don tell the group was that lessons get delivered in the midst of ice, snow and cold. If you are not listening, you lose. 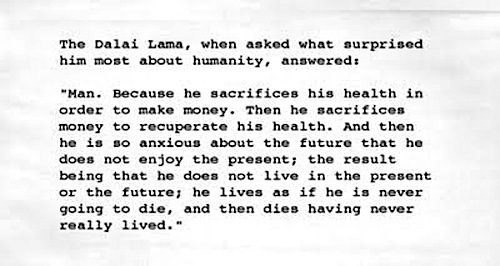 Each of us is a student who needs to pay attention. The goal is not only to survive, but to be comfortable in uncomfortable conditions. Once you get cold and on the road toward hypothermia, you get cranky, frustrated, and become disturbed in your focus. This is an area that I fervently avoid. I hope that some of my readers will attend next year’s Snow Walkers’ Rendezvous, at the Hulbert Outdoor Center, at Lake Morey, VT on November 9-11, 2012. I plan to be there. I was up early to head over for the fresh coffee in the dining hall at 6 AM. Luckily I found other early risers that I really wanted to talk with- Linda Leckie, Don Kivelus, Bob Kimber, and Mike McClelland from Tennessee, who hosted Don and I when we were at Trail Days in Damascus in May of this year. I also enjoyed connecting with Vermont’s own Bad Influence, AKA Mark Shaw, my backpacking and winter camping buddy. The food here is the best, plus there’s always so many interesting folks to sit near and chat with. I am sure to check in with Bev and Joel Hollis, who always manage to get in a most remote and amazing unguided experience somewhere up either in the Northwest Territories or the Alaskan bush each summer. After breakfast we had three presentations from veteran winter travelers that included Linda Leckie, Tony Morse, and Steve Young. The credentials these folks bring to Vermont is staggering, for example, Steve Young founded the Center for Northern Studies in Wolcott, Vermont back in 1971. Steve has worked in the Arctic and Antarctic for over 40 years, especially in western Alaska and eastern Siberia. His newest project is the creation of the Center for Circumpolar Studies. One of the favorite times of the weekend is the Tour of the Tents, this year emceed by Alan Brown. 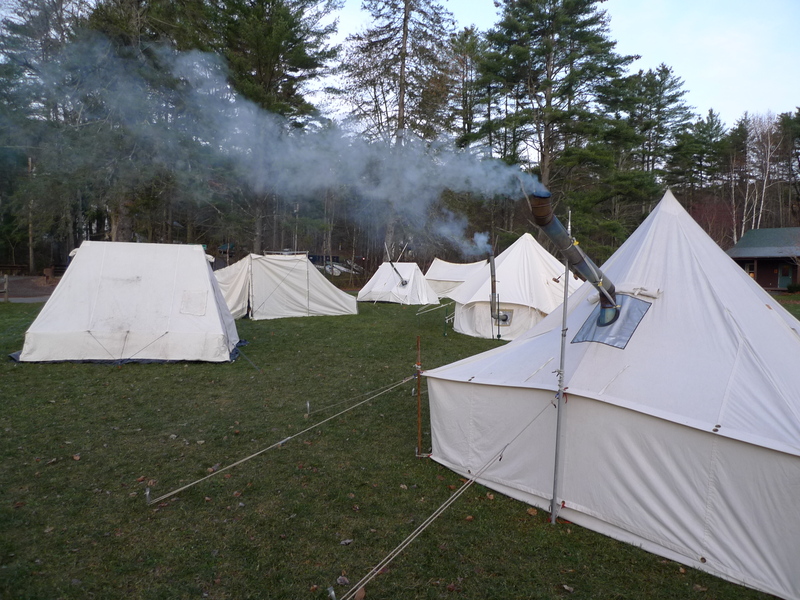 Over a dozen of the weekend participants chose to live in their heated wall tents for the weekend. The tour is a chance for the participants to hear the pros and cons of each of the tents, as the owners share their experiences with the group. Here’s a small tent that I’d love to add to my collection, but you are looking at over $1,000 of gear here, if you include the stove and stove pipe. After lunch I attended two longer workshops. 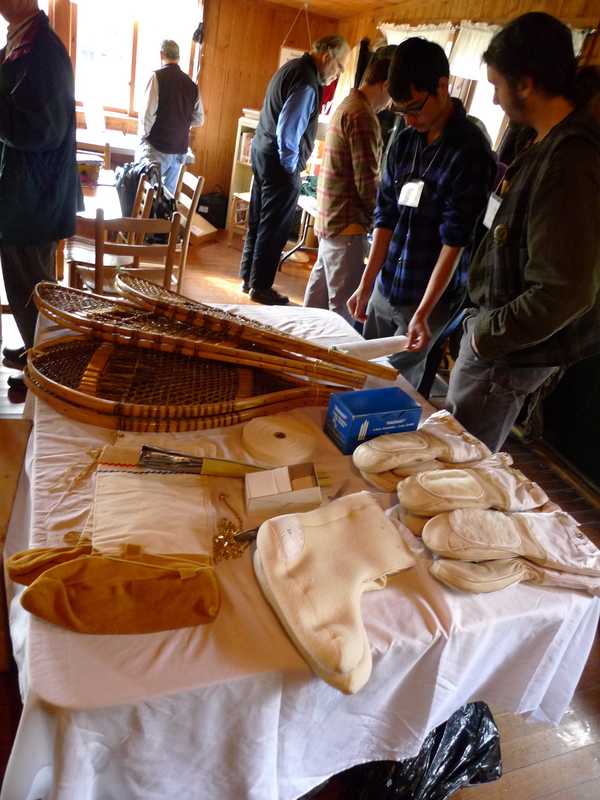 The first was “All You Ever Have to Know about Pitching a Wall Tent”, from Craig MacDonald. Craig has worked out doors for the past 44 years for the Canadian Ministry of Natural Resources, and is probably the most experienced winter camper I know of. He talks, I listen. 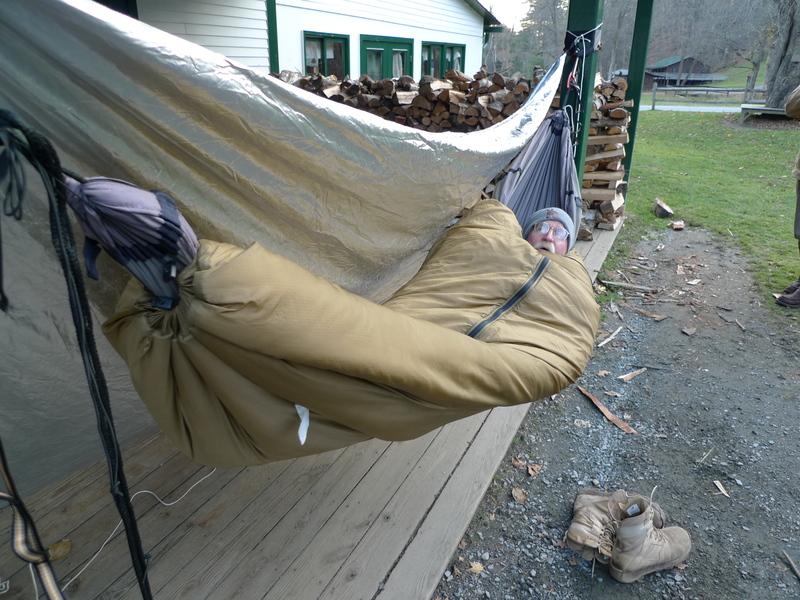 Next was Don Kivelus, hailing from St. Francis Minnesota, illustrating his “Hammock Hanging at 30 Below” talk with the actual gear he uses in the boundary Waters of northern Minnesota. Don owns the Four Dog Stove Company. 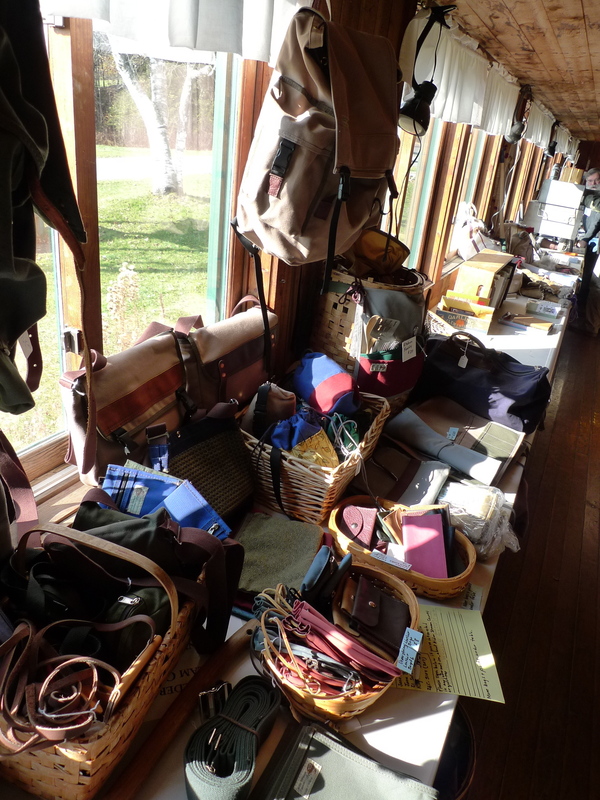 Here is on shot of his winter hammock and another is his vendor table. Then it was back to the cabin for me, where I rested up before an excellent dinner. The evening’s activities included two half hour slideshows/talks. The first was Bob Kimber’s “Backyard Snow trekking in the Maine North Woods”. 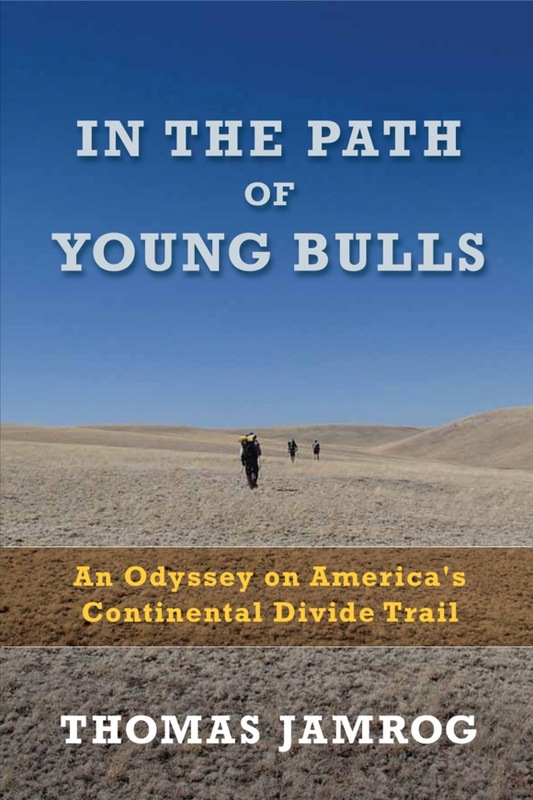 Bob is a writer and explorer who has been published extensively in Audubon, Down East, Field and Stream , and Yankee magazines, and is the author of several popular books, including my favorite- A Canoeist’s Sketchbook. Bob claims I saved a 2008 winter trip when a case of beer froze. Bob posted a slide of me holding up a bottle of Yukon Jack in from of a winter camp that we shared several years ago. That trip can be accessed here: Big Bog. If you go to the site you can see real-life applications of what I have learned at Snow Walker’s. Saturday evening concluded with a most interesting presentation by George Luste, “Reflections on my Winter Trips in the North”. The trips were to Labrador, and on Baffin and Ellesmere Islands. It’s not only incredible that we have the ability to go to these far away places and walk around but it’s even more incredible that we live through some of these harsh experiences in order to tell these stories. At 6:40 AM on Thanksgiving morning I was barely able to get the VW up the hill outside of my house in Maine. We were delayed one whole day due to a freak Nor’easter that howled and dumped ice, slush, and snow for about 10 hours straight. Even now a foot of snow covers the ground, yet no plow trucks have come by to spread sand on the icy, frozen road. Two hundred and fifty miles of driving later , and on the very next day, I enjoyed a one hour walk with Jody, our dog, wearing just a long sleeve shirt beside the Taunton River. It’s a warm, kind place, and the soils here still look rich. I learned to swim in the warm , salty Taunton as a child. I can see why a colony of refugees would stay in these calm broad waters. 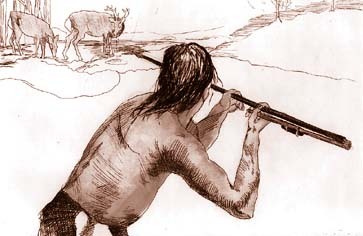 The Taunton served as an ancient water highway, since Paleo Indian artifacts found here dated small human sites 12,000 years, or some 600 generations ago. 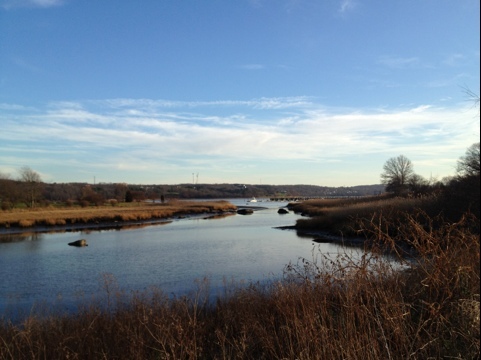 Another historic tidbit was heavy use of the River in 1675, where the native Wampanoags battled the English settlers in King Philip’s War, considered the bloodiest war in American History. This territory is brought to life in Nathaniel Philbrook’s “Mayflower: A Story of Courage, Community, and War“. The first Thanksgiving was held nearby here, with the real story narrower than the “table of bounty” love-fest that my sixth grade history book described. 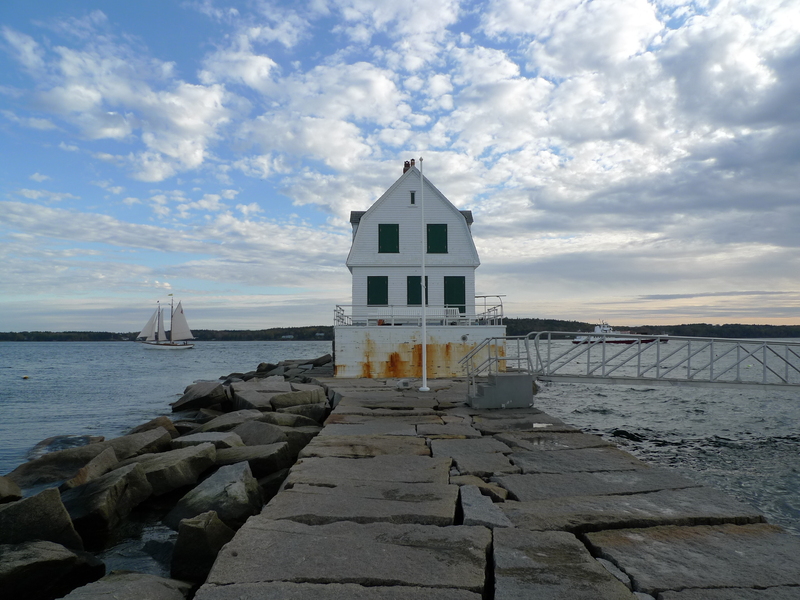 When the the Mayflower’s refugees arrived in Plymouth Harbor it was during a period of crisis for Native Americans as disease spread by European fishermen devastated their populations. Philbrook notes that initially, the two groups maintained a fragile working relationship. But the clashes of the two cultures eventually erupted into a savagely bloody conflict that nearly wiped out both the English colonists and the natives. I recently read that “Thank you” is the only mantra that you’ll even need. It’s making big sense to me this Thanksgiving. 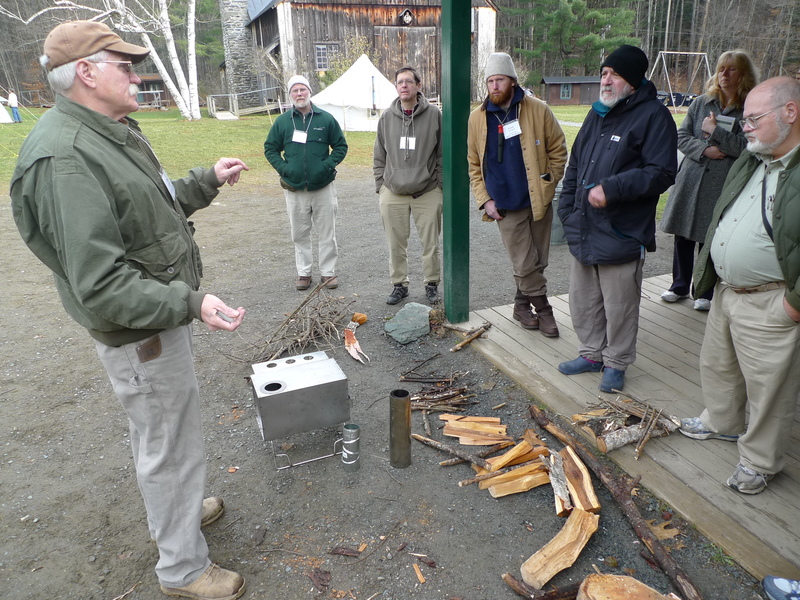 Another grand time at the Hulbert Outdoor Center in Fairlee, VT, spent with 100 of the faithful at our annual winter walking/ camping/ and cooking weekend. When we arrived after our 5 hour trip, numerous participant tents were already set up outside, with clouds of wood smoke conveying the sense of warmth that was present inside. Instead of hauling our tent and poles, Marcia and I had decided to rent a room in one of the heated cabins for the weekend. From where else can I return home with a hand drawn illustrated handout from the likes of Craig MacDonald that details “ The ‘three pole’ Anishinabi Wall Tent Pitch”? Craig came all of the way from Dwight, Ontario, where he has worked for the Ministry of Natural Resources for the past 44 years. I bought my 9 x 12 Egyptian cotton tent from his 10 years ago. The Friday evening kickoff presentation was by Kevin Slater and Polly Mahoney, of Mahoosuc Guide Service in Bear River Vally, up in Newry, Maine where for over 30 years the couple have been actively guiding canoeing and dog team trips in Maine and points north. On the way back, Marcia and I had the fortune to stop at Polly and Kevin’s where we were introduced to two of the newest members of their 44 dog force, true Alaskan huskies that had just arrived in Maine after an air transport from Alaska. The male of the pair will grow to 90 pounds. These dogs are considered to strongest, most devoted pulling dogs in the world. 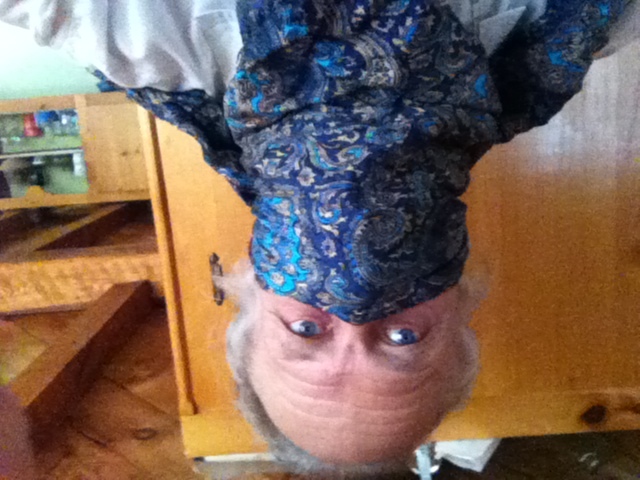 It is a video of twenty five ways to wear a scarf. 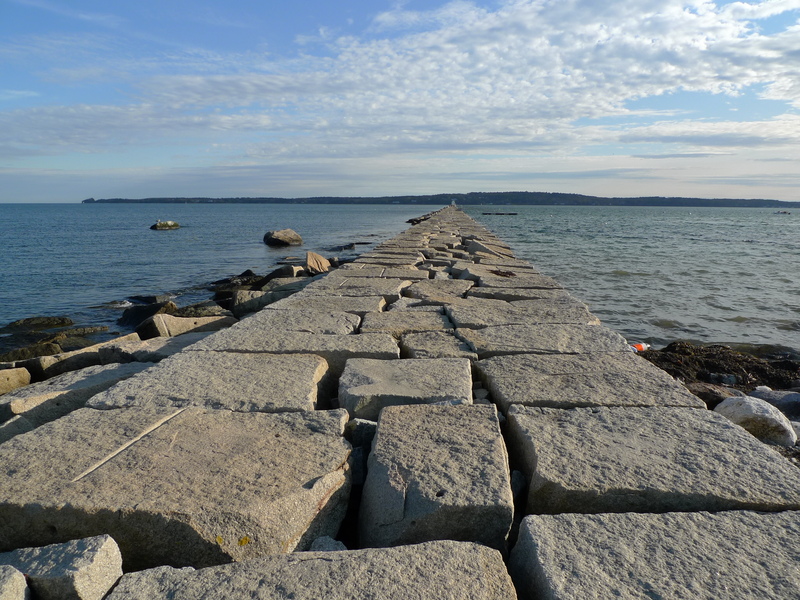 The most unique hike in the Midcoast Maine area is the one mile (Well, really 7/8 mile) granite path known as the Rockland Breakwater out to the light house at the end. Ready, set, avoid the cracks. The breakwater was completed in 1902, after an 11 year construction period. It was manned until 1965, when it became automated. The city of Rockland acquired it from the Coast Guard in 1998. The light house keeper lived with his family in a house in Glen Cove or Rockland. He either commuted to work in a boat, or walked the Breakwater. I recently re-discovered the pleasures of this walk when I was at work in Rockland and in desperate need of an activity break. With just an hour to spare, I hopped in my car, and drove the short distance to the parking lot near the Samoset resort, where there were a half- dozen vehicles. It was easy to see the scattered array of people stretched out on the 1 mile long granite finger that goes waaay out into the Bay. I went out at high tide. Still, I kept keep my feet dry by dodging puddles. This is a thrilling walk which can leave you in several moods, depending on the clouds, wind, and outside temperature of both the air and water. This picture was taken just at the end. To the left is an antique schooner, heading out into the Bay. To the right is the Maine State Ferry that is completing its 70 minute trip from North Haven Island. Next, I plan to see how long it takes me to walk the whole way out and back from the office. As of Sunday, Daylight Vanishing time is upon us here in Maine, again. Not only is it now too dark outside to ride my bicycle before supper, it is also the start of the official month long deer hunt. I’m rightfully frightened of getting shot, so I stay out of the forests, even when the sun is brightly shining. In fact, a hunter was accidentally shot and killed in Maine just yesterday. I don’t like this double whammy November situation. 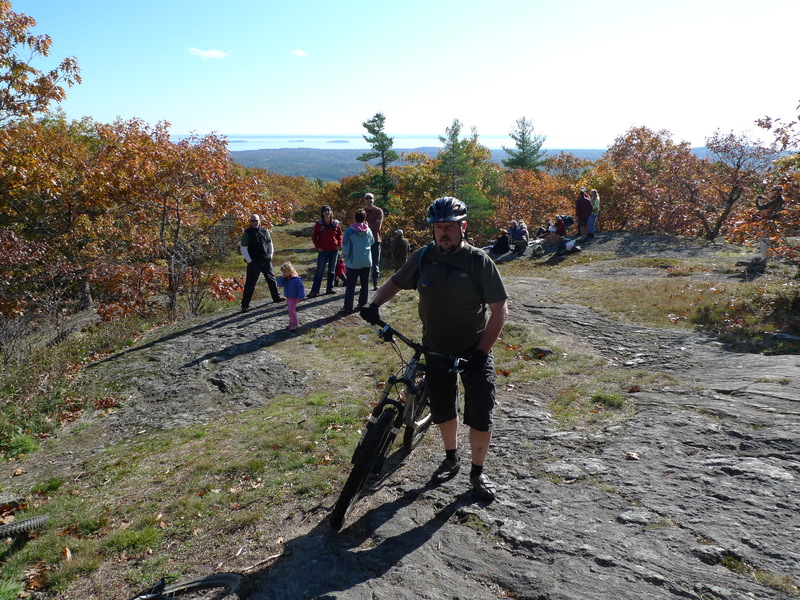 So I rode three afternoons last week, twice in the woods, and once on the roads around Moody Mountain. Probably the last time I’ll get three rides in until March or April. Snow piles from last Sunday’s storm are still solid, on the north side of my garage, in the shady places. On last Thursday night’s ride, I teamed up with three of my riding group- The Bubbas, as we all clicked on our high intensity halogen headlamps, labored up Ragged Mountain, and pumped our lungs and legs up and down the leaf-obscured trails, only to revel our arrival with intact bodies and bikes back down in the parking lot. The dark world is upon us. The light was clear, so were the roads, but we had this refrigeration effect, as I looped around Moody Mountain on a bike ride this Halloween. I was dressed appropriately, with orange jacket, as I dodged several pickup trucks that were shoved along the banks of snow on the sides of the roads. Bad day for deer, anytime snow falls during hunting season here in Maine. I did see one big doe, exiting the woods along Moody Mountain Road. I wished her well. There was something special about the ride today, with colorful orange foliage still hanging on the red oaks and even some of the sugar maples. You are never too old to learn about the outdoors. The lesson today was how remarkably different the temperatures and snow loads can be, even in a radius of 5 miles. 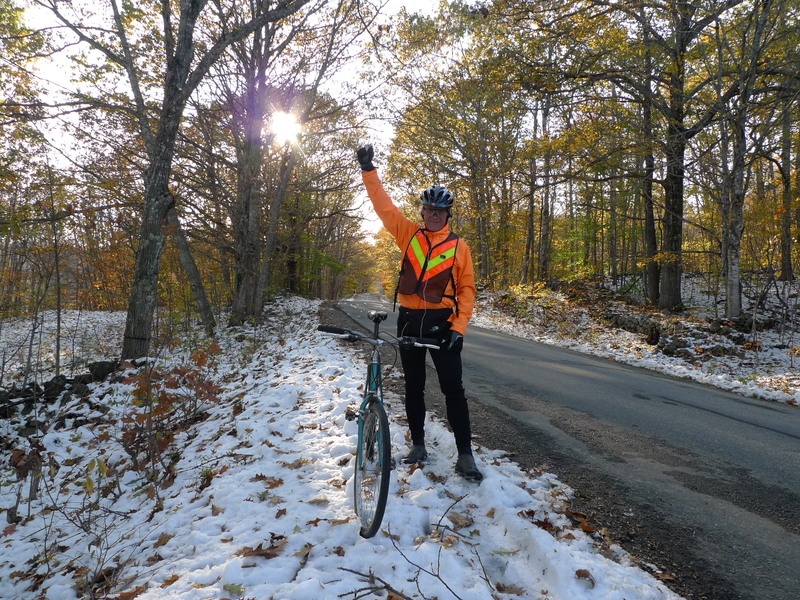 On some south facing sections of my ride, there was no snow, yet on the north side of Moody, the feeling of cold was immediately obvious, and was the two to three foot piles of plowed snow on the sides of the road, and the ice patches that I had to avoid. I thought about my hike in the High Sierra last year, where my choice of a campsite was influenced by proximity to water, north slopes, and wind patterns. 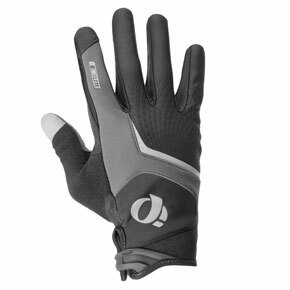 High praise for the Pearl iZumi Cyclones, the company’s most popular cool weather cycling glove. It’s a softshell, advertised as providing superior wind and water protection. I have not used it in the rain yet, but as far as warmth goes, it is better than most. I bought the gloves for hiking the last time I was up in North Conway, NH at the factory outlet. Added features are the extended gauntlet to keep the wrists warm, a fleece wiping surface on the thumb to clear away you know what, and the XXL size gives me a bit more room, which allows some additional heat. Too tight isn’t good in the cold. I was reluctant to purchase them , as there are many stitching panels, but the salesman convinced me me that they hold up well, and if there was EVER any problem with the glove to bring the right back and they would be replaced. I find that on this type of garment, the stitching unravels. I have maybe 4 pairs of similar gloves, but none have been as warm as these, and I get tired of stitching up tears in the fingers.